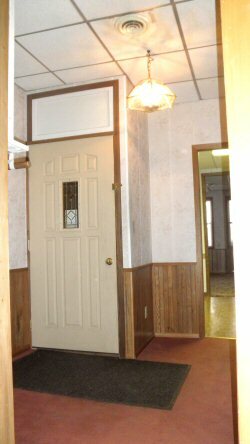 This quiet well managed 4 unit rental complex is owner occupied downstairs! PLEASE call 320.583.9561 for more information or for an appointment to see these. Answered week nights to 7 p.m.
Conveniently located in the heart of Downtown Hutchinson. You'll enjoy being within walking distance of great restaurants', a movie theater, grocery store and other great shopping possibilities. Did you need something? You don't even have to start your car! 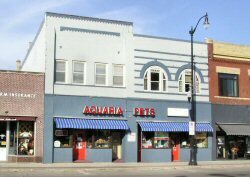 FOR SALE 30 South Main Street (on the left) 2,200 square feet It has 100's of plug ins and. 200 amp electric service front and back entrances with a large upstairs apartment. Or Rent it for only $1600 per month. over 2200 sq feet plus a basement and loft office. Located in Beautiful and Thriving Downtown Hutchinson, Enjoy HIGH VISIBILITY on Main Street State Highway 15. Both Buildings have Front and Back Doors with On street or Parking in Hutchinson's many Lots. For more info click on the addresses! Please call 320.583.9561 for an appointment to see these. You'll love them! What can we do to help you into your new home? PLEASE call 320.583.9561 Answered week nights to 7 p.m. for more information or for an appointment to see these. IF YOU SMOKE OUTSIDE & DO NOT LITTER! You pay only electric, heat & Cable if desired. Sorry no dogs are allowed. **Cats will be accepted after the required a $240 non-refundable fee and $40 per month extra per cat. Maximum 2 cats. Sorry No Dogs Other caged pets o.k. with prior approval! Conveniently located in the heart of Downtown Hutchinson. You will enjoy being within walking distance of great restaurants', a movie theater, grocery store and other great shopping. Did you need something? You don't even have to start your car! Downtown Suite Huge and Private! 28 South Main Street AVAILABLE NOW! This is Downtown #1 it is only $599 per month based on a one year lease*add 15% for a 6 month lease and 10% for a 9 month. You pay only your electric and cable is desired! You'll enter your apartment through your 10 x 14 kitchen. as viewed from your living room. The walls are bright and easy to clean glass board. The floor is no wax tile. Kitchen Photo three as viewed from your living room. The walls are bright and easy to clean glass board. The floor is no wax tile. Your bedroom view from the living room. This apartment is well sound proofed and quiet! You will feel at home here! Your bedroom side view is 10 x 12 feet. It has two large 32 x 64 inch windows to let in the cool summer breeze and sunshine. Think of how this would be a great apartment for you and a friend .It is economical and comes with everything you could want. You pay just electric! **PLEASE NOTE** Because of Fire Codes there will be a maximum of two People Allowed in this apartment THANK YOU! Washing Machines are just outside your door! 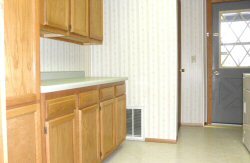 This quiet unit is in the back of the building with Conveniently located in the heart of Downtown Hutchinson. You will enjoy being within walking distance of great restaurants', a movie theater, grocery store and other great shopping. Did you need something? You don't even have to start your car! This is Downtown #1 it is only $599 per month based on a one year lease*add 15% for a 6 month lease and 10% for a 9 month. You pay only your electric and cable if desired! Thank You for visiting our Website. We greatly appreciate your interest! Comfortable Peaceful LARGE ONE Bedroom Non-Smoking SUITE. We have a large 1 Bedroom Suite Beautiful Main Street view. With Central Air, your own washer and dryer and a large private deck. Approximately 1,100 square feet. Please page down for more details! $879 Month Based on a one year lease. This suite has its own private entrance that you can lock at the bottom (street level) and at the top level. Can you say PRIVACY? AVAILABLE NOW! View of Dining room facing man street. Tastefully finished with Z Brick wall and track lighting! You also have your very own washer and dryer. In your very own laundry room! on So you can enjoy the convenience of your home! Your Living room looking South! We have just finished remodeling it. JUST FOR YOU! Here's an example of what the 1 bedroom Suite looks like. Tastefully decorated by one of our tenants. Sorry! Furniture not included! 10 x 16 feet with an 8 x 3 ft closet. Newly remodeled! These windows look out on to your very own 12 x 16 deck! The floor is Maple wood patterned with a Huge refrigerator freezer. 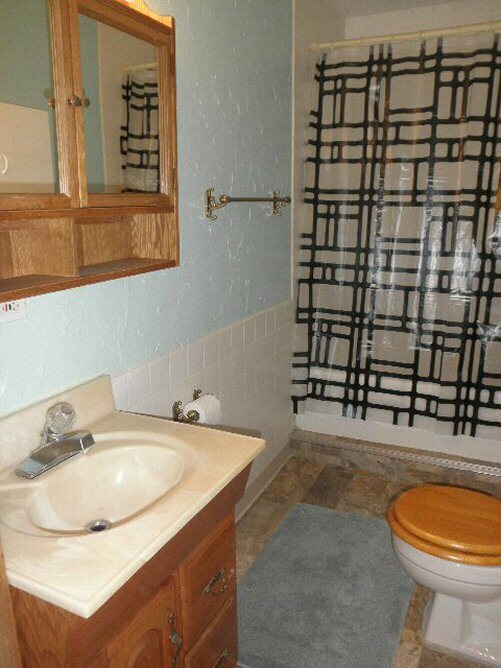 t has lots of cupboard space with a double sink and room for a kitchen table at the other end. Look at the counter space. The range has a glass top. Butcher Block” Counter top with a glass heat proof cutting board. Your laundry room has a large capacity Washer and a Gas Dryer. You will not a generous amount of cabinets with a folding area. We have just put in a new floor. JUST FOR YOU! Only $879 *Based on a one year lease. Pay only heat, electric and cable if desired. You'll have your very own 12 x 16 deck! Your are allowed to have a gas grill. Watch the sunset and relax! f you wish to entertain outdoors, it even has lights. This suite has its own private entrance that you can lock at the bottom (street level) and at the top level. Can you say PRIVACY? This secure building is across the alley from the police station and has Security cameras. The ladies love it! You pay only electric, heat, telephone and cable if desired! Sorry no dogs or cats are allowed. Other caged pets o.k. with prior approval! We perform criminal and credit background checks $40 per adult. You can relax knowing your that your neighbors are good people!